As Maurizio Sarri’s struggles at Chelsea continue this season, it’s reported that the club have two potential replacements in mind if they make a change on the bench. Despite a promising start at Stamford Bridge, the Italian tactician has seen his side fall three points adrift of fourth place with just eight games to go this season. The Europa League remains their only hope of silverware, while Sarri’s attempts to transform their style of play have encountered struggles as they haven’t fully convinced with their performances either. In turn, question marks have been raised over whether or not he will still be in charge next season, and they will only intensify further if he doesn’t deliver on the minimum objectives this year. According to The Sun, two names are emerging as potential replacements for the former Napoli boss, with Wolverhampton Wanderers manager Nuno Espirito Santo and Blues legend Frank Lampard specifically touted as being in contention. The Portuguese tactician undoubtedly has the better CV and experience, leading Wolves to the Championship title and promotion last season while they now sit in seventh place in the top flight and have arguably established themselves as the best of the rest outside the established top six. In contrast, Lampard is facing a real battle to even get Derby County into the playoffs, and given that is his first lead role in management, there is surely concern that he might not yet be ready for the Chelsea job. 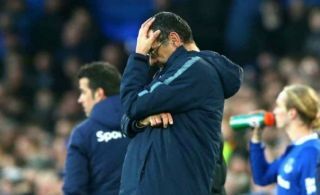 In turn, should Sarri be sacked at the end of the season, Santo would surely be a strong contender as per the report above, although the sentimental factor of taking Lampard back to Chelsea could be too strong an appeal to ignore, especially having seen what interim Man Utd boss Ole Gunnar Solskjaer has done at Old Trafford since December.